Rhinoplasty is often referred to as a “Nose Job.” Having your nose Job in Bangkok is a fantastic choice for women and men looking to reshape their profile and get boost in self-confidence. Over the years, our clients form Australia,Singapore,England and America have chosen to come to Bangkok for Rhinoplasty for many reasons including the high quality of care,professional western trained Thai plastic surgeons not to mention affordable prices that make Thailand the leading destination for medical tourists around the world. People choose to have nose augmentations for aesthetic reasons or for reconstructive reasons such as correcting birth defects, breathing problems or after an injury that resulted in a broken nose. Depending on your wishes and physical limitations the outcome of having nose surgery in Bangkok can be subtle or dramatic in as little as 1 private week in Thailand. Many doctors around the world consider Rhinoplasty to be the most complex plastic surgery operation today. Mainly due to the facts that facial structures and anatomy vary tremendously between different people. 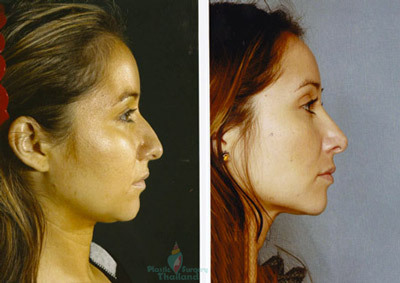 Rhinoplasty surgery in Bangkok therefore must be customized for each person separately. Our pre-approved plastic surgeons in Bangkok and Phuket can enhance your visual appeal to blend in seamlessly with your existing facial structure to give you a 100% natural appearance. The framework and makeup of your nose is comprised primarily of cartilage and bone. The Upper part of the human nose is primarily supported by a dorsal hump and bone. The Lower part of your nose is mainly supported by tiny plates of nasal cartilage that protrude from the center of the nose to help to define the actual appearance and profile shape of your face and nasal tip. Nose surgeries are popular because they can help redefine your look by altering the shape and tip of your nose. Before undergoing Rhinoplasty, it’s very important for you to tell your chosen surgeon about any current medications you are taking. Our board certified nose specialists can offer virtual consultations and review your current pictures and desired outcome prior to your arrival in Thailand. This allows you to better understand your planned nose surgery procedure in detail along with any benefits or risks and also helps to answer any questions you have before about your nose job before you arrive. He or she may also request additional information about your expectations before committing to the nose job procedure. The initial internet assessment with one of the top rhinoplasty surgeons in Thailand will provide you a very detailed understanding of the actual treatment including the extent of the surgery and exactly how you will look post surgery.